Finding a way to extend the life of satellites that have exhausted their fuel, strayed off orbit or lost position has been an industry quest for decades. Earlier efforts have gotten close, but were ultimately determined to be unworkable for economic or other reasons. Jean-Phillipe Gillet, Intelsats regional VP for Europe/Middle East, is sitting in a most comfortable position. It seems just about all of the satellites under his influence are mostly sold, with many of the transponders pre-sold in the shape of upcoming satellites. At the end of March (probably on March 29-30), a new satellite is scheduled to join Intelsats portfolio in the shape of New Dawn, a clever addition in that the craft is owned by a consortium led by Convergence Partners and Intelsat. New Dawn will slot in at 32.8 degrees East, and slap in the middle of Intelsats huge African coverage zone that now comprises a massive 22-satellite long-term commitment. New Dawn will supply 28 C- and 24 Ku-band transponders and will, no doubt, grow the already significant revenues earned by Intelsat out of Africa. Leslie Klein is also the co-founder of C-COM Satellite Systems Inc., which was founded in 1997 with the intent of designing and developing a system capable of delivering high speed Internet over satellite into vehicles and transportable structures. With the rapidly growing demand for Internet services world wide, and with no technology available to make it transportable, C-COM designed, developed, manufactured and sells its proprietary iNetVu Mobile Satellite Antenna Systems which make it possible to deliver high speed Internet services, voice over IP and video over satellite into locations where no terrestrial infrastructure exists. Leslie Klein is an Electrical (Professional) Engineer with MBA and PhD degrees. Dr. Klein was employed by such notable corporations as Hewlett Packard (NYSE: HPQ), IBM (NYSE: IBM), Control Data Corporation, and Bell Northern Research (part of Nortel Networks). He has been involved in the high-technology business over the past 35 years and has been a founder of a number of successful computer companies. Greg Pelton is Senior Director of Cisco Internet Routing In Space (IRIS), which is a major Cisco initiative that is transforming space-based communications by allowing satellites to become part of the converged IP network and enabling Next Generation Global Services. Through IRIS, Cisco will extend the information transport power of the Internet into space, integrating satellite systems and ground infrastructure for commercial and government users who need anytime, anywhere IP-based data, video, voice and mobile communications. Mr. Pelton is responsible for creating a suite of space-ready products and developing the business plans and go-to-market strategies necessary to fulfill the IRIS vision. Previously, Mr. Pelton led the Cisco Technology Center, which created strategies for entrance into new markets and to incubate disruptive technologies to create growth opportunities for Cisco. Greg led Cisco into new businesses, including IP telephony, wireless networking, home networking, broadband cable, IPTV, mobile networking, and Cisco TelePresence. He was also responsible for developing strategic partnerships with industry leading companies, creating ecosystems with technology startups, funding university research programs and driving the development of standards. Before joining Cisco in 1998 Mr. Pelton held executive positions at Nortel Networks, developing telecommunication products for service providers. He also established and operated a JV with Daimler Benz. Greg is recognized for his work in equity investments and acquisitions, and is a frequent speaker on innovation and emerging technologies. The plethora of opportunities for private and public sector investors throughout the region that exist in the commercial space and satellite industry will be examined during the third annual Global Space & Satellite Forum (GSSF), in Abu Dhabi on 9-11 May. For the past several decades, maritime communications have been dominated by the L-band satellite frequency. When conceived, L-band provided a very good channel for reaching ships and freighters traveling deep ocean routes. To consider any of the other terrestrial bands would involve outfitting ships with large, costly antennas that only oil and gas freighters could reasonably afford. So over time L-band grew to become the de-facto industry standard, covering nearly 90 percent of all vessels sailing the seas. However, with the march of time, new opportunities presented themselves that challenged L-bands status quo. Chief among them were new advances in antenna technology that modularized on-board receptors for IP switching and automatic re-pointing. This perfectly fed into recent industry changes that expanded the availability of the much more extensive Ku-band over the Pacific and Atlantic Oceans. Taken together, satellite providers could now offer maritime companies global broadband service via a VSAT network, a considerable quantum leap in the field of maritime communications. The 1.8m antenna sitting on top of the laundry building at Hospital Sacre Coeur in Milot, Haiti, a rural northern community located only 70 miles from the still-devastated city of Port au Prince, might not look like much to passersby. With the increasing availability of sophisticated voice and data communications options in both land-based offices and domestic environments, businesses and employees are pressing for flexible, cost-effective solutions  wherever their location. Throughout the Atlantic Ocean lie some of the worlds most seafood-rich areas, including prime spots for tuna. In order to meet the ever-growing demands for seafood, todays fishermen dont just cast a line or toss nets and then wait and hope for the best. Trident Seafoods of Seattle, Washington, recently selected KVHs TracPhone® V7 satellite communications system and mini-VSAT BroadbandSM service to provide Internet and voice services for business communications and crew morale aboard six of its 130 to 162 trawl catcher vessels operating in the Bering Sea. 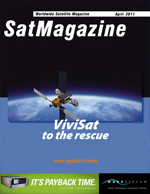 High-speed satellite broadband has become a constant, universal demand for vessels that must stay connected as they travel across commercial shipping lanes, through severe weather patterns, and in and out of ports scattered around the world. Harris Selenio is the industrys first integrated media convergence platform  a modular solution that combines traditional baseband video and audio processing, compression and IP networking features within a single, 3RU platform. Theres no secret that the global demand for backhaul is increasing at an unprecedented rate. This demand is being driven by wireless and wired users in well-connected parts of the world, and the two-thirds of the world not currently using the Internet but looking for ways to cost effectively gain access to it.